I solved these almond cookies though. I got it into my head to pair chewy, crispy almond cookies with roasted strawberries and toasted coconut, but finding the perfect almond cookie recipe took some experimenting. Thankfully, the failures were still edible and much more satisfying than a mathematical model of drug diffusion. Don’t worry about understanding that last part. Something I learned along the way is that almond paste and marzipan are not the same thing in Canada (or the US). Marzipan has a much higher sugar content than almond paste and makes a more liquidy cookie dough. I finally found the recipe though, and I am sharing it with you. On their own these cookies were good. But as soon as I scooped some tender, juicy, roasted strawberries onto them and took a bite, I was in love. The cookie is crispy on the outside, slightly chewy on the inside. 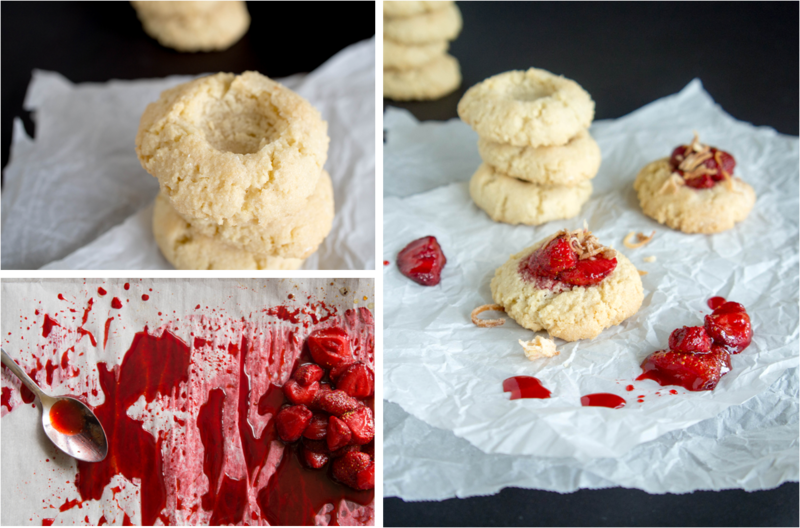 The strawberries help mellow out the cookie’s sweetness and prevent it from being cloying. Toasted coconut and strawberries were meant to be together. 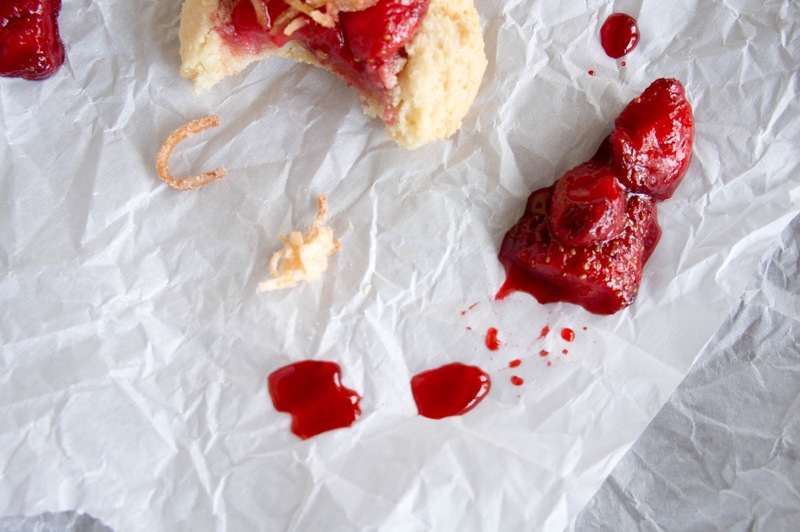 Strawberries are also delicious atop creamy filling in a tart, paired with rosemary and sipped, or crushed with mint and dipped. If only all problems could be roasted, baked, sprinkled, and devoured. Combine almond flour, sugar, flour, and salt in a bowl. In another bowl, whisk egg whites until fluffy, just before the soft peak stage. Whisk in vanilla. 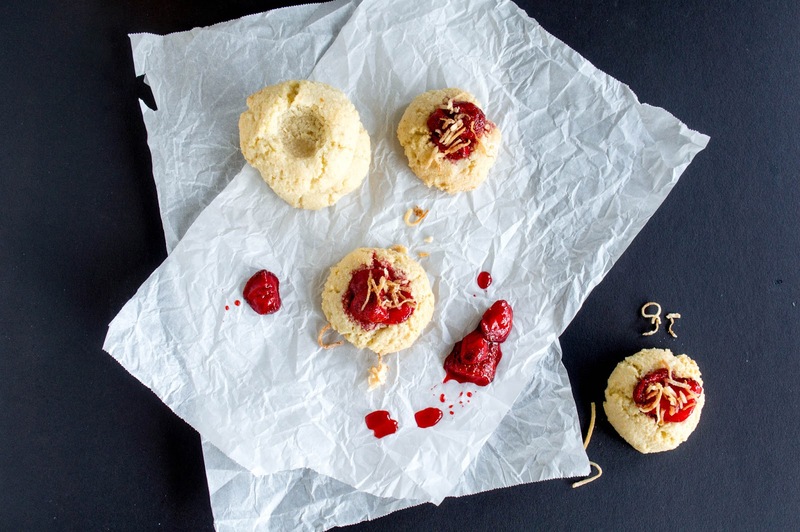 Combine fluffy egg whites with dry ingredients until a soft dough forms. Dusting your hands with powdered sugar, roll dough into balls about 1.5 inches in diameter. Place balls on a parchment-lined baking sheet, 1 inch apart. Using your thumb, make a dent in the middle of each ball (this will be for the strawberries). Let the cookies hang out and dry for 15 to 20 minutes while the oven preheats to 300F. Bake cookies for 20-22 minutes or until tops are cracked and bottoms are golden. Let cool on rack for about 5 minutes. 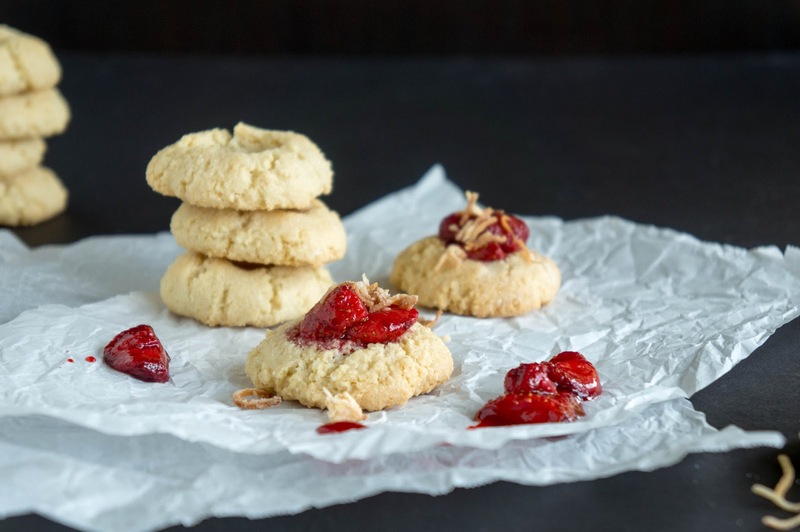 While cookies are still warm, re-form the dent in the center, because it probably puffed up during baking and let the cookies cool completely on a wire rack. Should make about 2 dozen cookies. Preheat oven to 350F. Spread coconut on a parchment lined baking sheet. Bake in the upper portion of the oven for about 5 minutes or until golden brown. Coconut goes from toasted to burned fast, so keep a close eye on it! Keep oven on for strawberries. Wash, hull, and halve strawberries (if the strawberries are really large you may want to cut them smaller). Spread on a parchment lined baking sheet. Drizzle on olive oil and honey, and sprinkle with a pinch of salt (don’t worry, they won’t taste salty, it just brings out the flavours). Toss everything together with your hands until strawberries are coated. 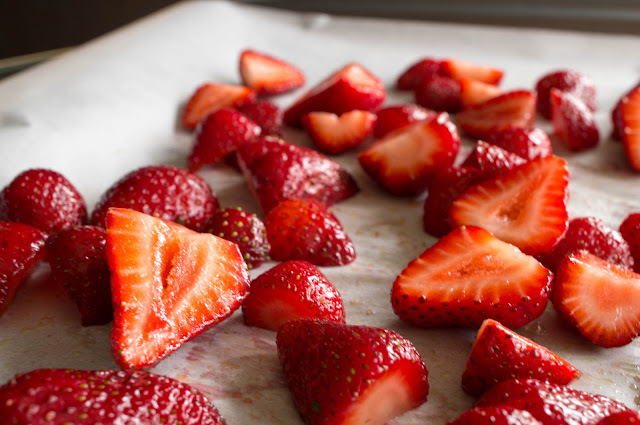 Bake at 350F in the upper portion of a preheated oven for about 20 minutes, or until strawberries are softened, fragrant, and juicy. 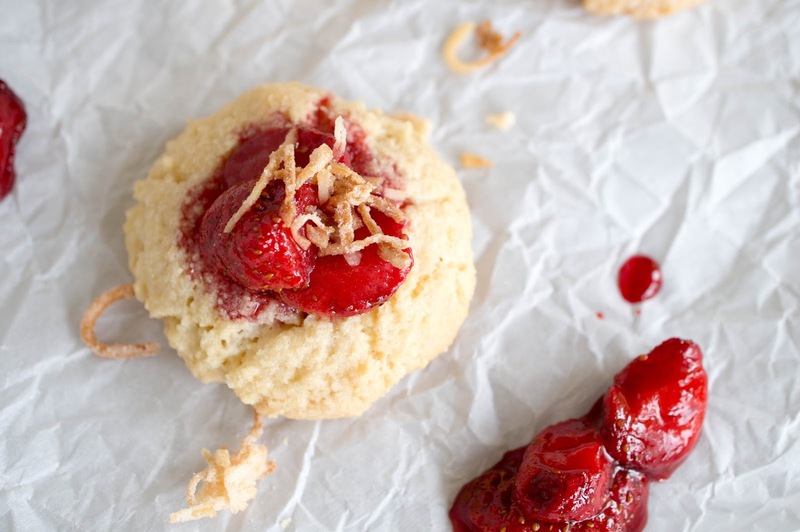 Fill the cookies with a teaspoon of roasted strawberries and sprinkle with toasted coconut.